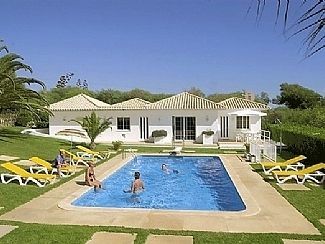 Villa in Galé Beach, Albufeira, Central Algarve,Portugal, situated 50 mts. from the beach of Galé. Situated aprox 50mts. walk from one of the Algarve's beautiful stretch of sandy beach. Lovely garden and pool (which can be heated at a supplement charge). It is close to some of the best beaches on this part of the Algarve coast., such as S. Rafael, Evaristo, Coelha.. There are several good restaurants and a few bars within a easy walk of our property and it is ideally located for those who want peace and quite, but be relatively near to all amenities. En-suite bathroom to bedroom 1 with bath/shower, basin, bidet, wc. En-suite bathroom to bedroom 2 with bath/shower, basin, bidet, wc Bathroom with shower, basin, wc to bedroom 3. Spacious, bright lounge with 2 sofas, 1 armchair, satellite TV, DVD and music system. It has full patio door out onto shaded terrace overlooking the pool and garden area. Cooker, hob, fridge/freezer, dishwasher, washing machine, microwave, toaster, iron, ironing board. Fully stocked with all kitchen utensils, crockery, glasses. The nearest golf course is 3 mins by car - Salgados Golf (preorganized golf packages can be arranged, please contact me for details). It can be heated at a supplement charge. Notes on accommodation: Air-conditioning on ground floor (master bedroom and sitting room). Downstairs is cool enough but electric fans can be provided on request. Suitable for children. Complete garden furniture. Clients are kindly requested not to smoke inside the house. Outside: The villa is surrounded with flowers, a long green lawn, shrubs and palm trees. There is a large table for eating alfresco with sea views. Sun umbrellas and sun lounges. Private pool for sole use of our guests. It can be heated at a supplement charge. Cleaning / Towels / Linen / Maid service: Maid service. Guests are asked to bring their own beach/pool towels please. We returned to this lovely villa after staying here last year and once again had a fantastic holiday. Manuel the owner is a pleasure to deal with both before and during your stay and nothing is too much trouble for him. The location of the villa is truly spectacular being literally a stones throw away from Gale beach. The villa has everything needed for a very comfortable stay and we will definitely return in the future. Gale itself is a lovely quiet place to stay with several excellent restaurants, mini market and supermarket. We hope to return in the very near future! Our 4th visit and it’s still wonderful - Manuel doesn’t seem to age one bit !! Lovely property situated very close to the beach in a quiet area within short driving distance of Albufeira. The owner Manuel was very friendly, welcoming and helpful with arranging local transfers. The food & drink left for us on arrival was a great start to our holiday. Would definitely recommend this property for families looking for a relaxing break in the Algarve. The nearest beach is Praia da Gale, nearby Praia da Coelha and Praia de Sao Loureço. Gale is a particularly wonderful spot to watch the fantastic sunsets and sunrises. Faro is about a 40 minutes drive. Car hire is not essential for this villa as there are a number of good restaurants and bars within walking distance and you can walk to the beach. Taxis are reasonably priced. However, we do always recommend car hire to make the most of your holiday in the Algarve as there are so many wonderful places to visit. It is a shame not to explore! We can organize transfers to and from the villa at very reasonable rates. Excellent car hire rates available. Contact-us. Water parks are within easy reach - Aqualand and Zoomarine (where you can swim with Dolphins) only a 15 minute drive and then a bit further Slide and Splash and Aqua Show. Many activities are close to hand - golf, water sports, tennis, horse riding, fishing, diving and much more. Guia Shopping Centre is situated 10 minute drive with a selection of shops, restaurants, cinema and bowling. Booking Notes: Upon booking a 20% non-refundable deposit is required. The balance is due 8 weeks prior to the commencement of your holiday. *** By booking now for 2019, we guarantee you 2018 rates! *** Changeover Day: Saturday, but sometimes we can be flexible regarding the changeover day. Notes on prices: Prices are for the property per week in UK Pounds and Euros.